May 22, 2019 | 5 to 7 pm | Carnesale Commons! 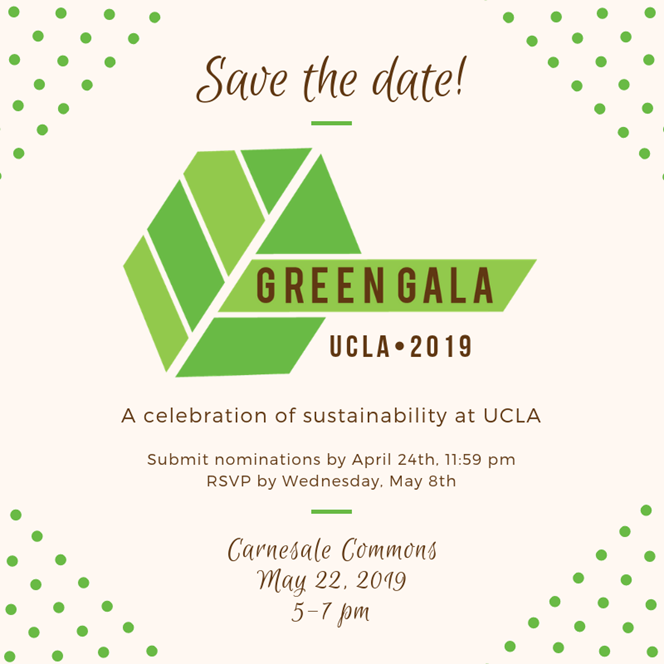 This event will gather UCLA students, faculty and staff from across campus to recognize and celebrate the work that UCLA is doing on sustainability. The evening will feature a reception, a keynote speaker, and an awards ceremony honoring key faculty, staff and students for their contributions to sustainability. The UCLA Chancellor’s Sustainability Committee and the Team Green student group will be selecting the award winners. We will also announce sustainability-related accomplishments from the last academic year such as LEED certifications, awards, key research findings, etc. Please share widely. Open to all UCLA Students, Staff and Faculty.